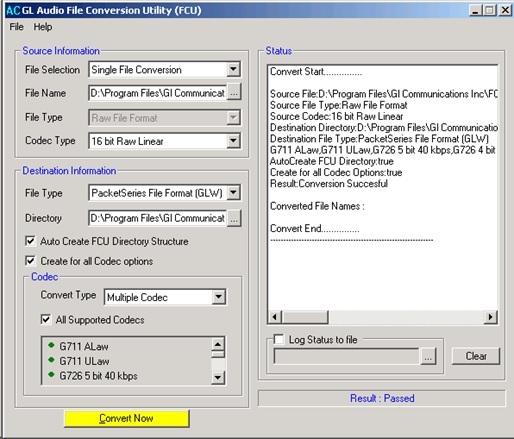 GL’s Audio File Conversion Utility (Audio FCU) is generally used in conjunction with GL Packet Series products to further enhance send and record voice file capabilities. This utility supports almost all industry standard voice codec data formats, that helps to convert recorded voice files from their native codec format to a GL standard format. This enhances the applications’ ability to send/receive voice files at a higher density with multiple codecs option. The utility also helps convert raw linear voice files/wave files from an Intel voice data format to a compressed GL Proprietary transmission format (*.glw) and vice versa. For more details on supported codecs, refer to Voice Codecs. The utility supports both 32-bit and 64-bit applications. It provides flexible options to convert Single or Multiple audio files for all or any of the supported codec types and stored in appropriate pre-defined sub-directories. 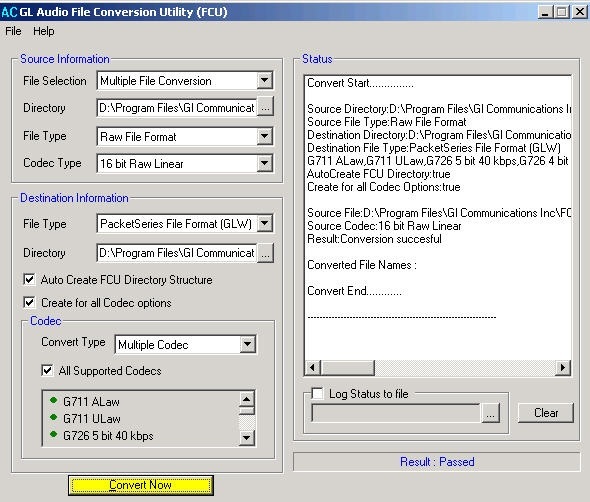 The Command line interface (CLI) in AFCU allows the users to load, start, and stop Auto FCU configurations, convert glw to PCM and vice-versa. Audio File Conversion Utility will be provided with the GL’s applications such as Voice Quality Testing, All MAPS IP based products and RTP Toolbox™. Single or multiple audio files can be converted to all or any of supported codec types and stored in appropriate pre-defined sub-directories. Provides following options for multiple conversion. All the converted files are stored in a single folder, with a short codec name appended to each file name. The codec type is also a file header in the file itself. A single source file can be converted to multiple destination files, one for each codec. 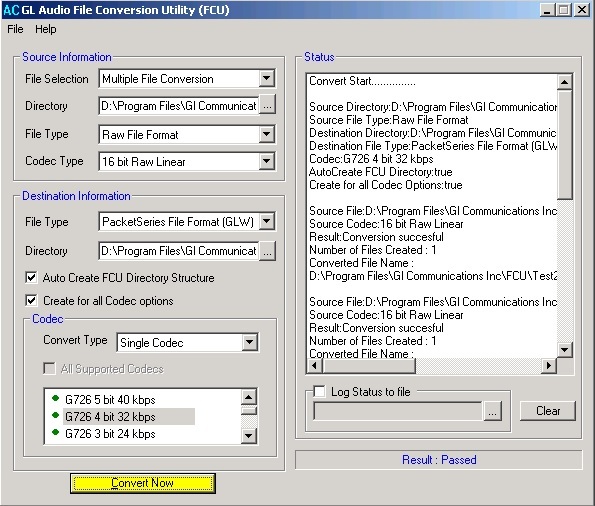 Based on the user selection, Audio FCU automatically generates a subdirectory for each codec and places the converted file inside the subdirectory. The GL’s packet series applications will fetch these converted files for send file function. In this case, all files of a particular file format present in the Source directory are converted. For each Source file under the source directory, exactly one file is generated and placed under the output directory directly. User can convert all files under a directory at once using this feature.